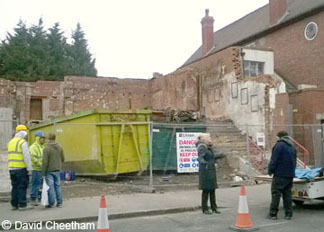 Birmingham lost a tangible piece of its rock music history when the remains of the Ritz Ballroom in King's Heath were demolished in January 2015 to make way for new development. 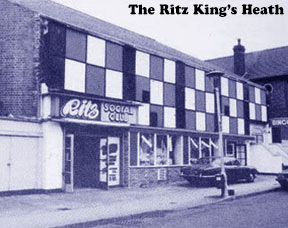 The Ritz was one of four venues operated during the 1960s and 70s by the famous promoters Joe and Mary "Ma" Regan who were instrumental in the development of the West Midlands music scene. Many famous names performed at The Ritz during the 1960s including Jerry Lee Lewis, Gene Vincent, The Rolling Stones, The Kinks, and The Pink Floyd. Mary Regan famously pre-booked The Beatles (for a modest fee) to play there in February 1963 by which time the group were number one in the record charts. Needless to say, it was a sell-out event! Loads of well-known local groups also performed at The Ritz including some who went on to become world-famous like The Moody Blues, The Spencer Davis Group, and The Move. Queues forming around the block were commonplace at The Ritz Ballroom during its heyday as so many waited to go inside and see their favourite bands or performers. The Ritz finally closed its doors in the 1970s to become a bingo hall before falling into disuse and later conversion to shops. Sadly, the building was severely damaged by fire in 2013. Good news is a community arts centre is planned to be built on this historic site (for more information see the 'King's Heath Walk of Fame' web site at: www.kingsheathwalkoffame.org.uk). David Cheetham who sent the photo wrote; "My wife used to go there most Sundays in the 1960s to see the up and coming Birmingham bands, such as Spencer Davis, Robert Plant etc. Also saw Julie Driscol, Long John Baldry - who flicked ash on her head while standing behind her, also PJ Proby, Alan Price and Wilson Picket, plus anybody who's around in the 60s going from there to the Brum Cavern and the Plaza at Handsworth."